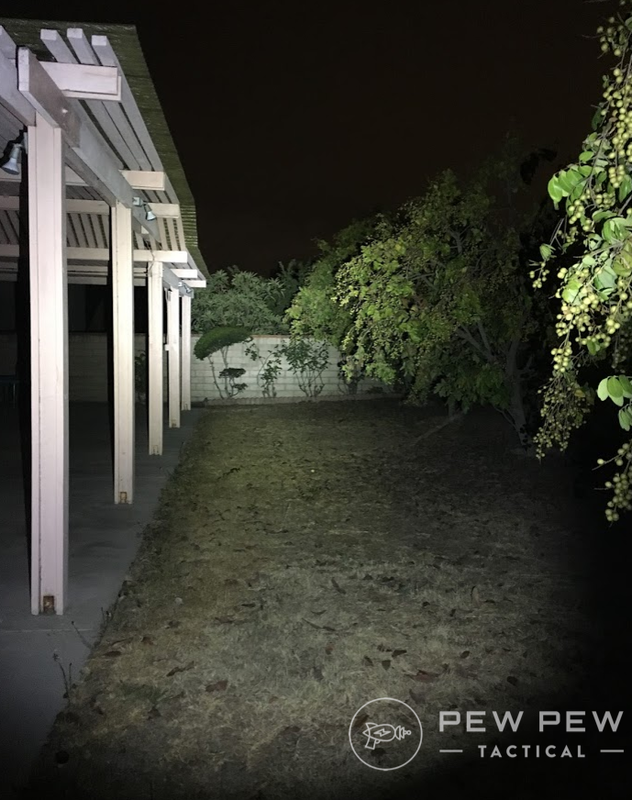 Flashlights are one of the best self-defense tools you can carry. 83% of our senses come from what we see through our eyes, and about 50% of the time, violent crimes happen at night time when our vision is limited. 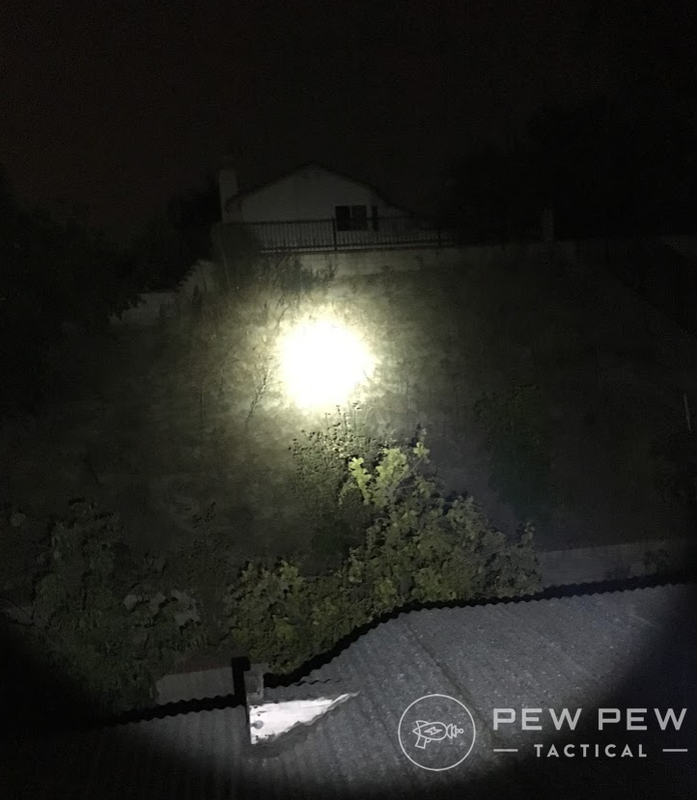 Having a bright flashlight allows you to identify the threat, momentarily blind an aggressor’s vision, and buy you extra time to take appropriate actions. 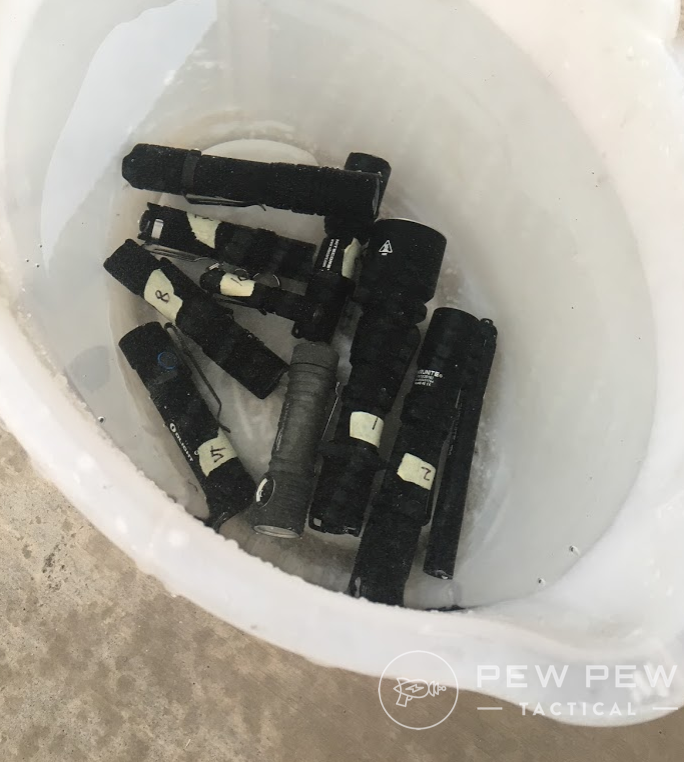 This isn’t just a roundup of Amazon reviews…we purchased all of these and subjected them to daily-use, drop-testing, and water submersion tests. Plus…pictures of the actual light spread pattern which matters a lot more than pure output. 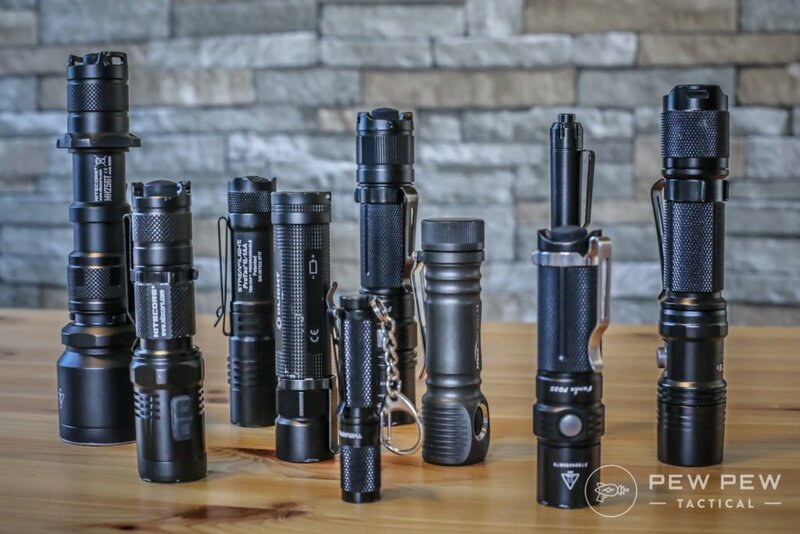 We’ll start with what we consider to be a “tactical flashlight” and compare 5 of the most popular ones under $100 to see which one is really the best. 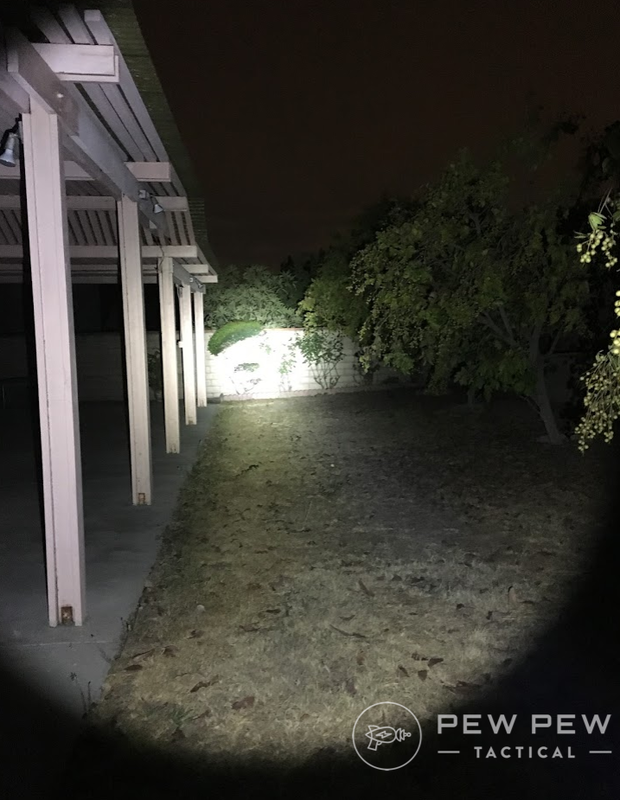 Besides being a well rounded flashlight, we believe tactical lights provide users the strategic advantage during a potentially dangerous situation. 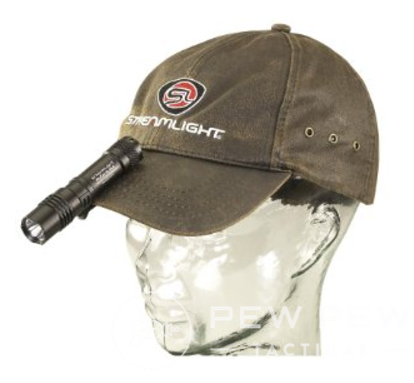 Tactical flashlights usually have a tail-activated switch to allow the users to turn it on quickly. They are bright enough to momentarily blind an aggressor, and they are built to sustain tough environmental abuse. Don’t need that stuff? Check out our Best Everyday Carry Flashlights instead. 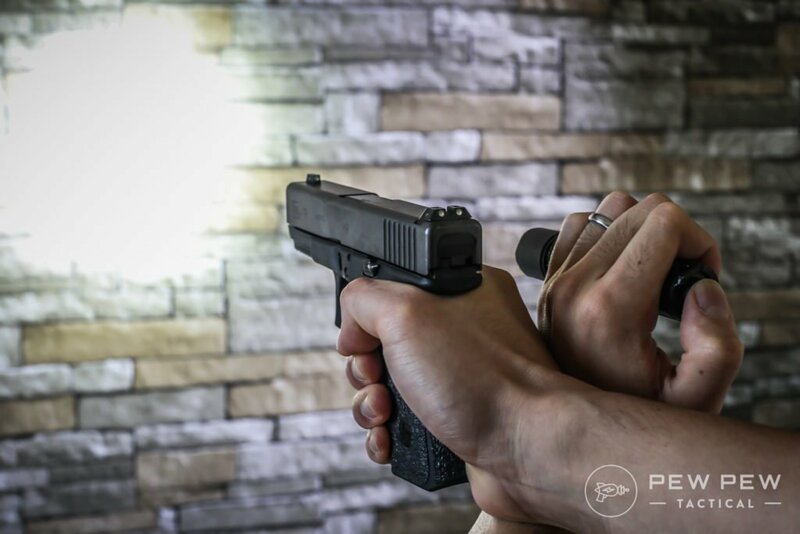 Or if you’re looking for something attached to your gun…Best Pistol Lights. 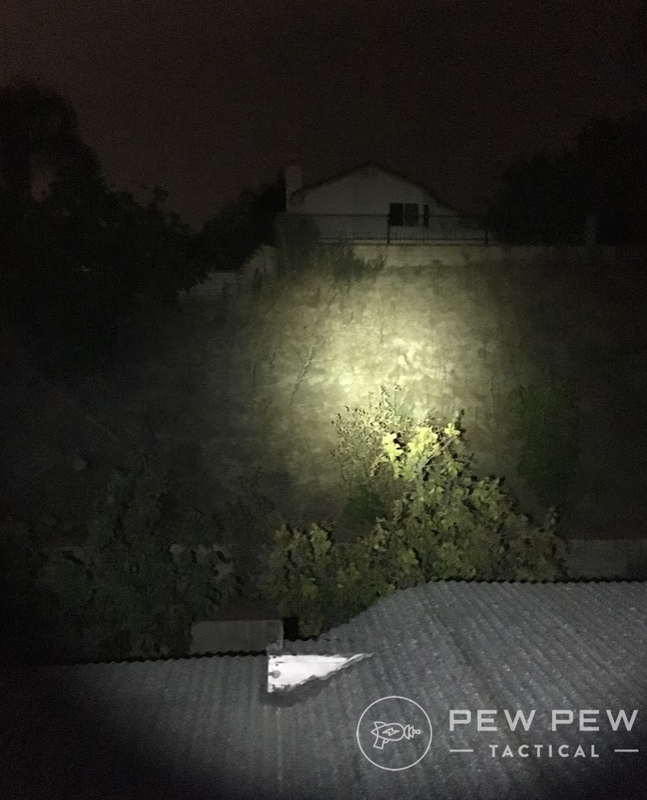 Given current LED lighting technology, we prefer tactical flashlights to have at least 500 lumen, a good amount of downrange reach, yet still small enough to be easily held in one hand while operating a handgun in the other hand if needed. Once we got the criteria set, we looked for flashlights from a reputable brand with on average 50+ reviews and 4.5 stars on Amazon. We also consciously picked a flashlight from different brands, so there’s a fair share of diversity and fairness with each manufacturer. 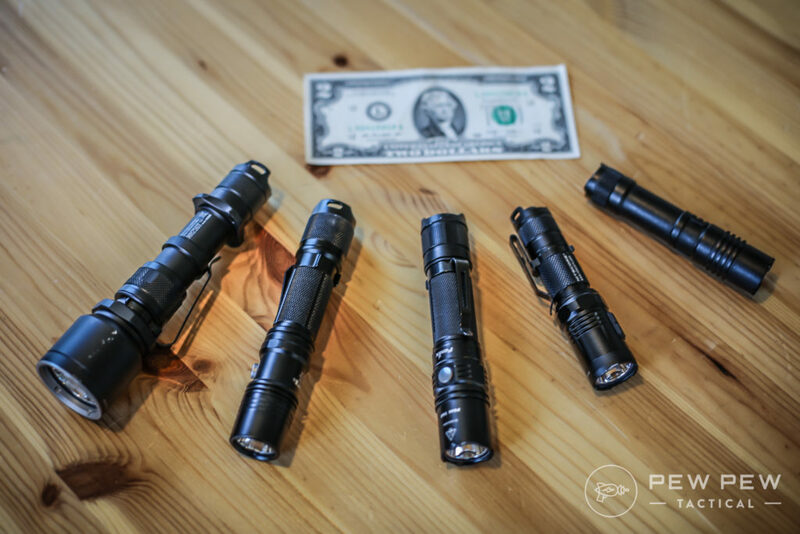 As for price, we limited it to $100 or less for the flashlight since we want for the best-bang-for-the-buck. If price is no object…we recommend the Surefire P3x Fury Tactical ($250). Lumen measures the amount of light being output by a source within a given area and time. The higher the lumen, the brighter the light is. One lumen equals to the amount of light received at a square foot area one foot away from a candle light. Not that helpful…so we will have pictures of the light pattern from our backyard. Often overlooked…the type of battery will matter a lot. 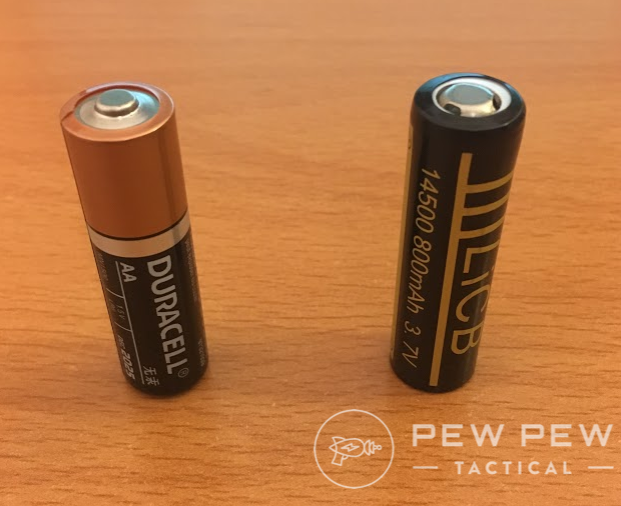 From cost to performance and time between recharges…what battery a tactical flashlight uses will sometimes make or break the decision. Enough talking…let’s see our first contender on the list! This is one of the longest-range lights we have seen in the market so far…with a max range of 452 meters or almost 1500 feet. The larger diameter in the bezel allows the light to merge into a strong focus beam down range. If I had a ranch or a large yard, this would be my preferred light to secure the perimeter at night. Plus it comes with a lot of goodies. Often time navigating in the dark, you want to preserve the night adapted vision with the low light setting. This also allows you to stay low profile and avoid being detected by the enemies as a vulnerable target. 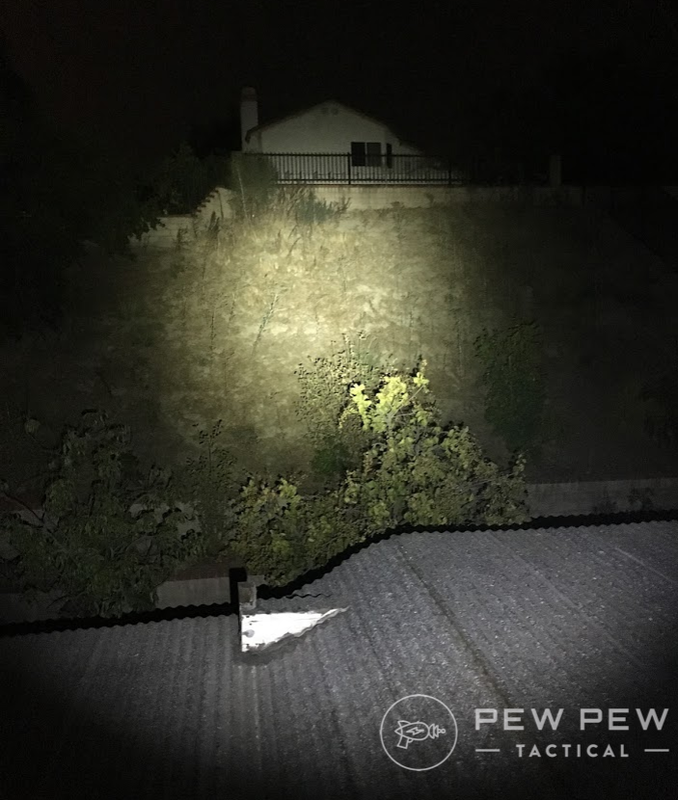 Yet the moment you detect movement far downrange, you need the ability to quickly switch to a stronger light to clearly identify the threat. 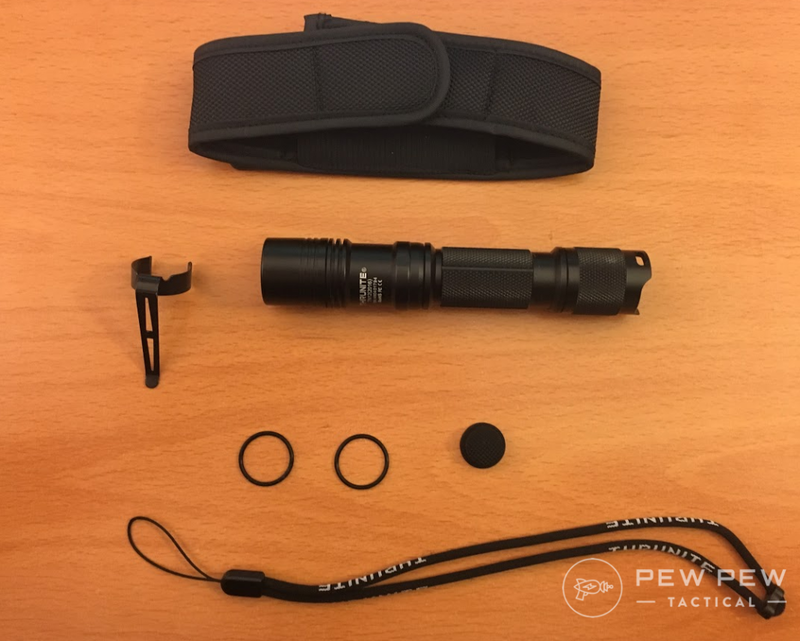 This light quickly toggles between two user selected settings by twisting the head and tail of the light, making this light very easy to use in such tactical maneuver. 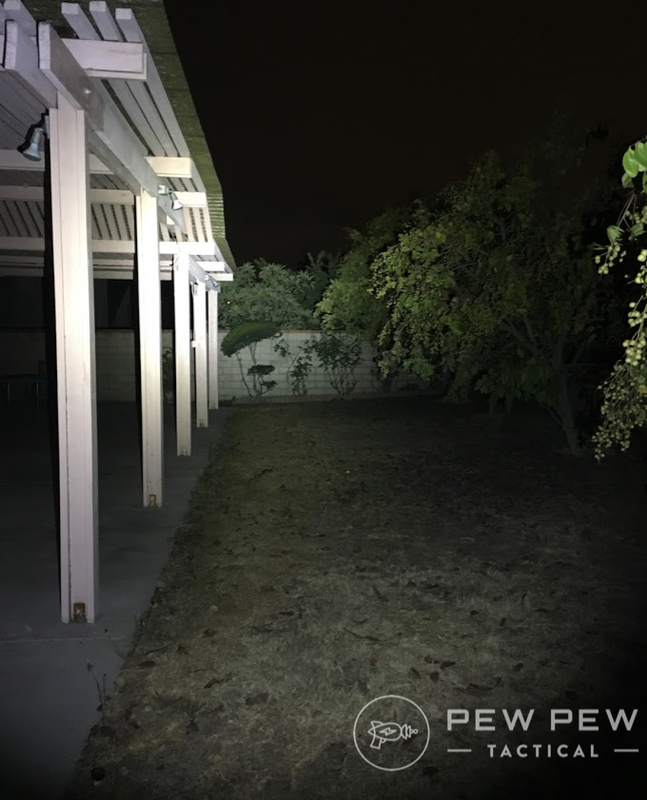 I set my MH25GT to toggle between the 1000 and 50 lumens, for tactical and night sight preserving purpose. One can observe a very focused beam even distance down range. The light takes a standard 18650 Li-ion rechargeable battery or 2 CR123 batteries. The bezel (front end) of the light is slightly larger than the rest of the body, so we found the ideal carrying method of this light to be holster carrying. 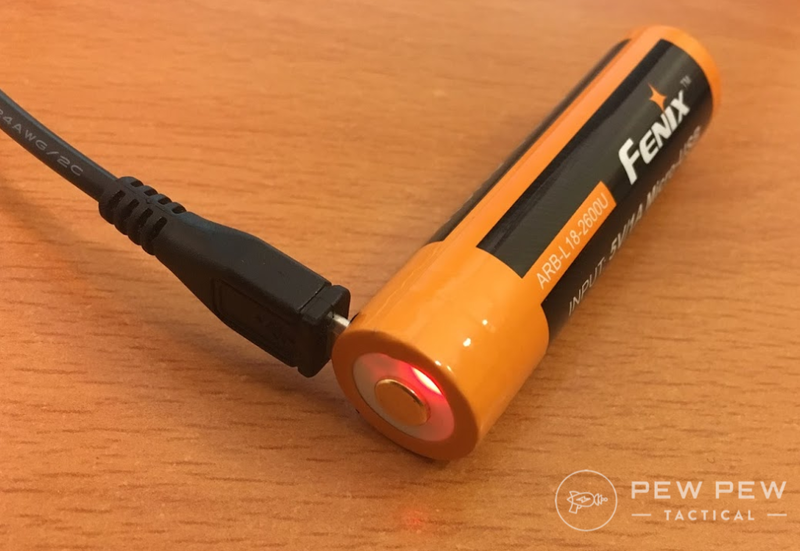 The mini-USB charging is another neat feature of this light, as you do not need to purchase any extra battery charger, nor do you have to carry a dedicated charger when traveling. The side of the flashlight opens up to allow user to plug in the mini-USB head for charging. There’s a small red light that indicates the charging status. The ThruNite TN12 light delivers an overall well-rounded feature for the users. At less than $50, this light is compact, lightweight, and sturdy. Holding the side mode switch for 1 second turns on the strobe mode. I usually kept it in the High 435 lumens setting since going to Turbo mode is only one click away. I personally use the thumb to turn on the light, and use my pinky to activate the mode switch button on the side. If you toggle between various modes often, it may help to mentally memorizing the 5 different modes as you switch between them. It has a more spread out and even area of light. The 0.4 lumen firefly mode is the perfect camping piss light. It allows you to preserve your eyes to the adjusted night vision. It also conserves the battery in emergency situation, allowing you to run your flashlights up to 74 days as rated. The manufacturer has warning against running the light at Turbo for more than 10 minutes. We obviously went ahead and tested it. At around 3 minutes, the bezel of the light becomes noticeably hot. And around 6 minutes it becomes very uncomfortable to touch. I stopped the test at around 8 minutes because I didn’t want to push the limit and damage the light just yet. All in all, the price and even beam spread make it our best overall pick. The well-rounded Fenix PD35 TAC light delivers an overall great experience. There’s a couple combos out there, and the light itself is around $65, but we recommend getting it with the 18650 Li-ion rechargeable battery that allows you plug in a mini-USB directly for charging, so no more separate charger is needed! A nice feature when you’re traveling or don’t have a battery charger. Alternatively you can also use 2 CR123 batteries for power. The power switch is built solid, and very easy to turn on and off. You press the button halfway and it goes to momentary on and off easily without issues. Since the mode switching button does not fully protrude out of the light, there are times when I found it hard to use my pinky to locate the button without looking at the flashlight. Compared to the ThruNite TN12, this light is not as hot in the Turbo mode. Per user manual, the light would automatically down switch from Turbo to High mode after 5 minutes of operation. Because of this feature, I was able to easily leave the light on past 30 minutes without risking damaging the light due to heat. 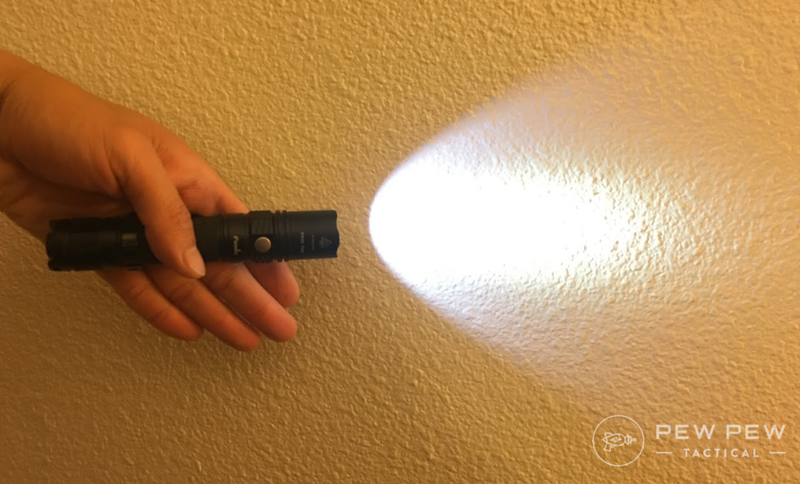 Now if you’re someone who’s used to having a flashlight with moonlight/ firefly mode, the lowest output at 8 lumen may seem a bit too bright. 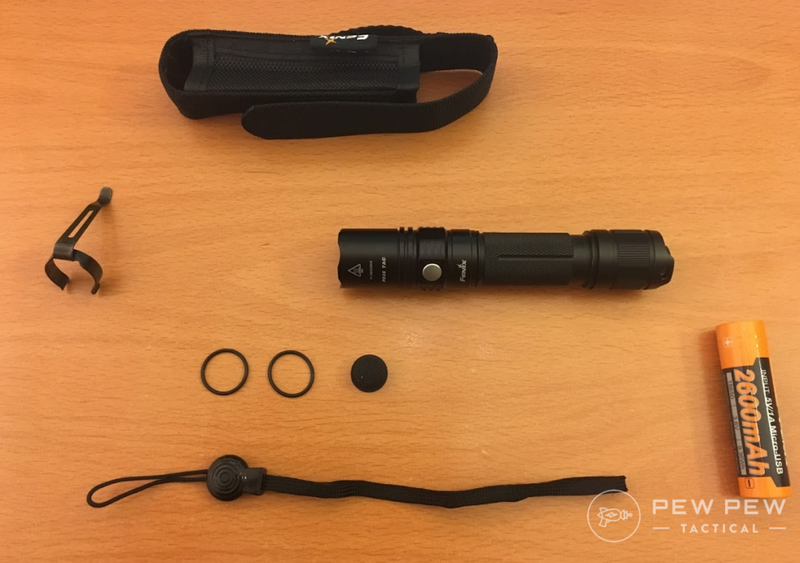 Waking up in the middle of the night, this flashlight may provide more light than needed for well adapted night vision eyes. 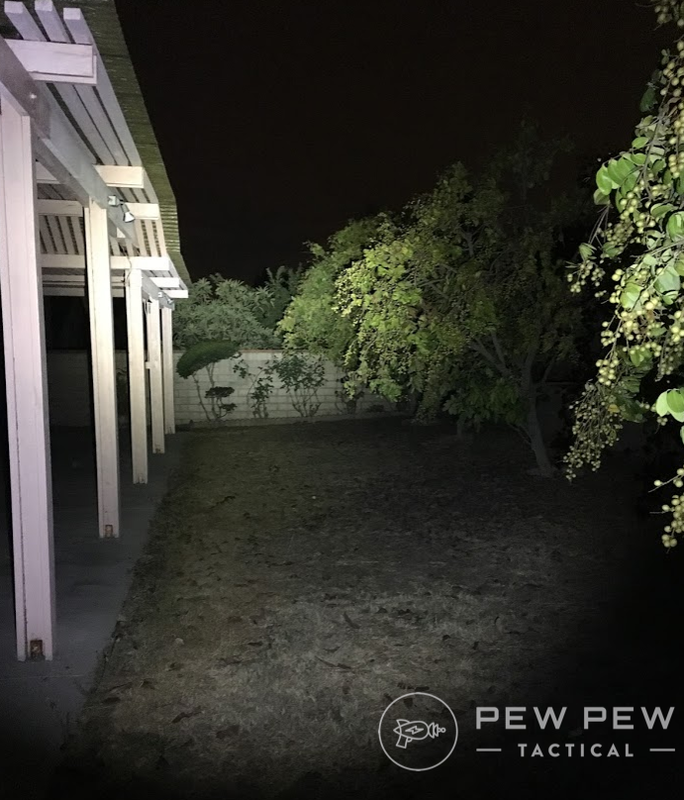 The light provides a well spread beam that’s sufficient to illuminate a whole room, and just enough concentrated light in the center to illuminate downrange. 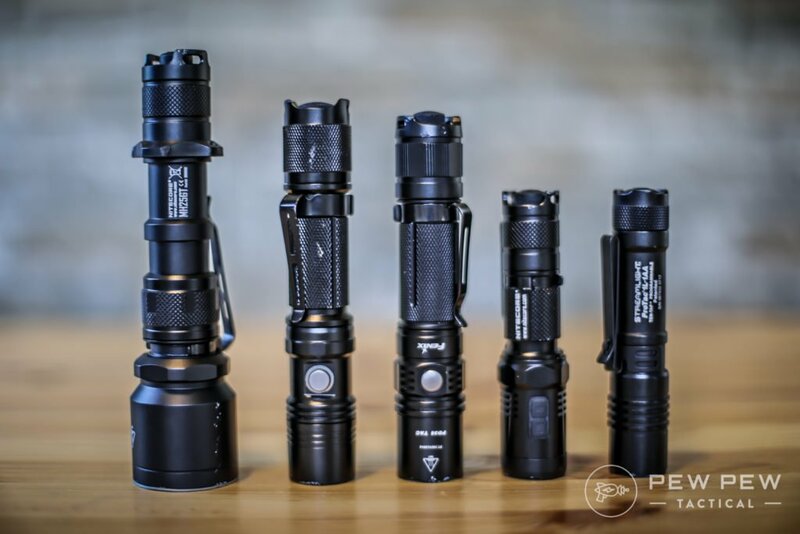 It ticks off all the checkmarks we have for a great tactical flashlight, but due to its higher price-point with a rechargeable battery, we’re awarding it the Best Overall Tactical Flashlight in the Premium category. 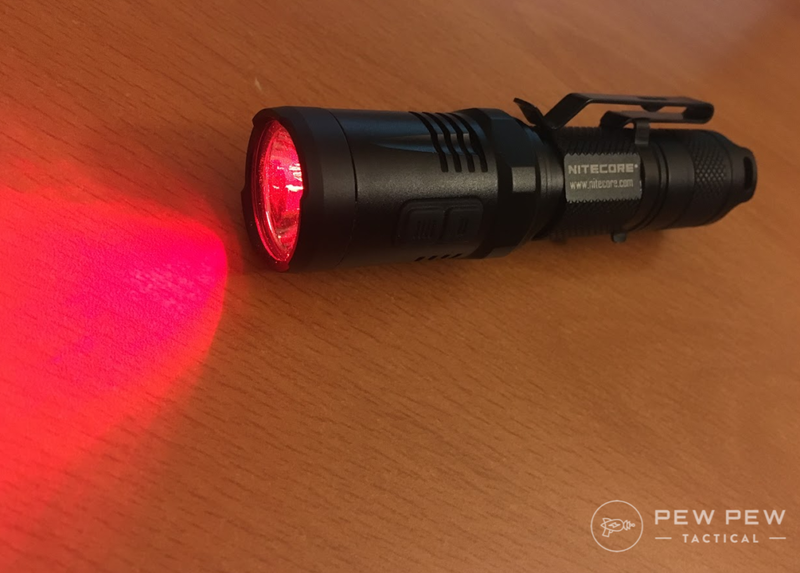 The Nitecore MT10A is the compact EDC sized tactical flashlight with a very thoughtfully designed red light. The light is about the size of an adult palm, and fits very nicely in the pocket. I enjoy carrying this light in the pocket for EDC purpose, yet it’s bright enough to be used as tactical light with tail end switch. This is my new favorite go to camping light as the red light feature allows me to travel in the dark without disturbing my night adapted vision, plus I can also travel invisibly in the dark since others won’t notice the red light from far away! Note that to achieve the 920 lumens rated, you actually have to use these IMR 14500 batteries. 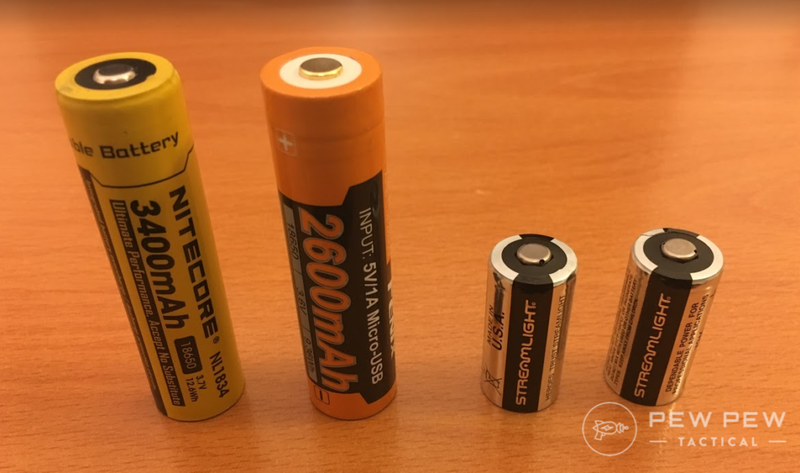 They are the same size as AA batteries, yet provides much higher voltage comparing to the traditional AA battery. The AA batteries will only push out 170 lumens. The IMR 14500 batteries are about $4 to $10 depending on the quality and manufacture. It creates a semi-focused beam that’s useful for searching and for general lighting up of areas. After 3 minutes of using the Turbo mode, the flashlight will lower its output automatically to prevent overheating. If you read into the manufacturer’s instruction manual, it would say “Do not use an IMR 14500 battery in low power.” Sounds strange, right? What it actually means is don’t leave the light on until it dies. It’s completely okay to use the IMR 14500 battery in the low output mode…probably a bad English translation here. 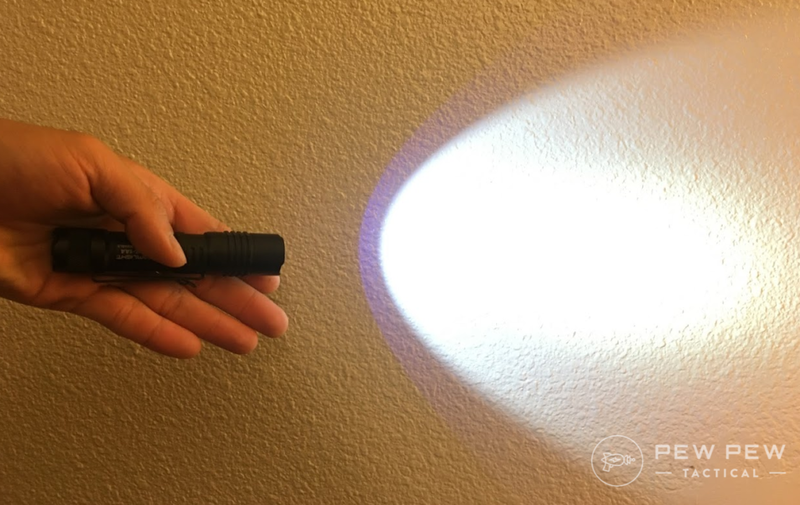 The Streamlight ProTac 1L-1AA 88061 is an easy to carry all around light. It’s small enough to fit nicely in the pocket without noticing it. And…the ProTac line has over 6600 reviews on Amazon with a 4.5 star rating! One of the greatest advantage of this light is its ability to take both the AA (or IMR 14500 rechargeable batteries) and CR123 batteries. 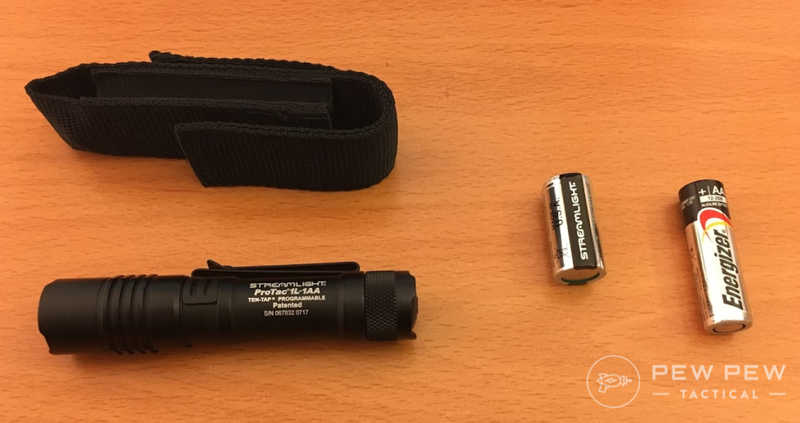 This makes the it an ideal light in a bug out bag, since you can find AA batteries everywhere. The operations are completely done through the single tail cap switch. Some users may like its simplicity, while others may find it a hassle to switch between modes if you constantly having to cycle to the low light mode. I personally appreciate the single button switch because that’s the only button I need to press for operation. 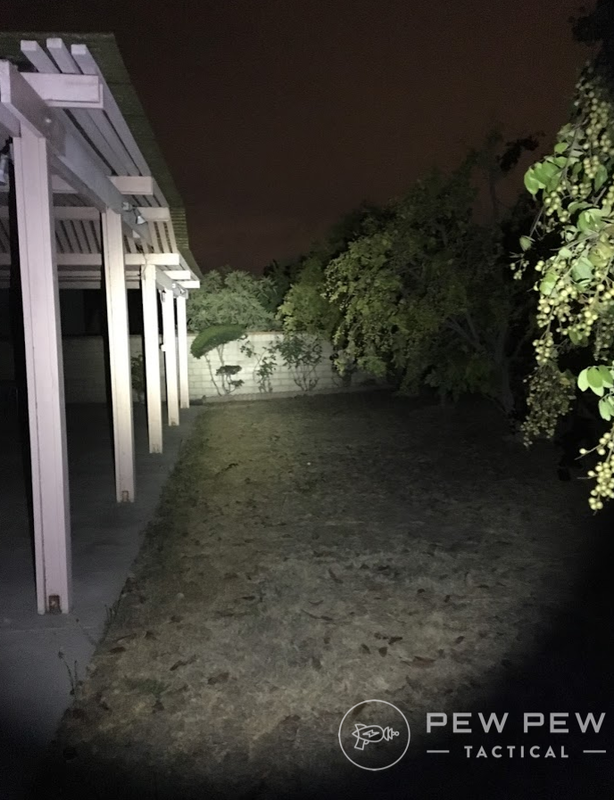 Comparing to some of the other lights outputting up to 1000 lumens, at 350 lumens, the temperature of this light does not appear as hot comparing to other lights. 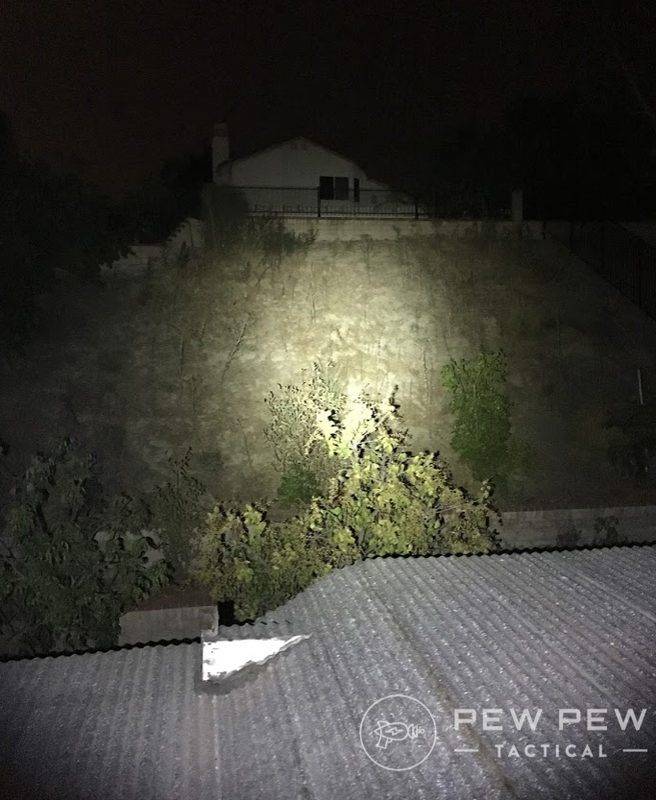 And I know…we wanted at least 500 lumens to be considered “tactical”…but we just loved this little light so much we had to add it in. After 30 minutes of operation on High mode, the bezel of the light only feels warm, and the temperature does not seem to increase. 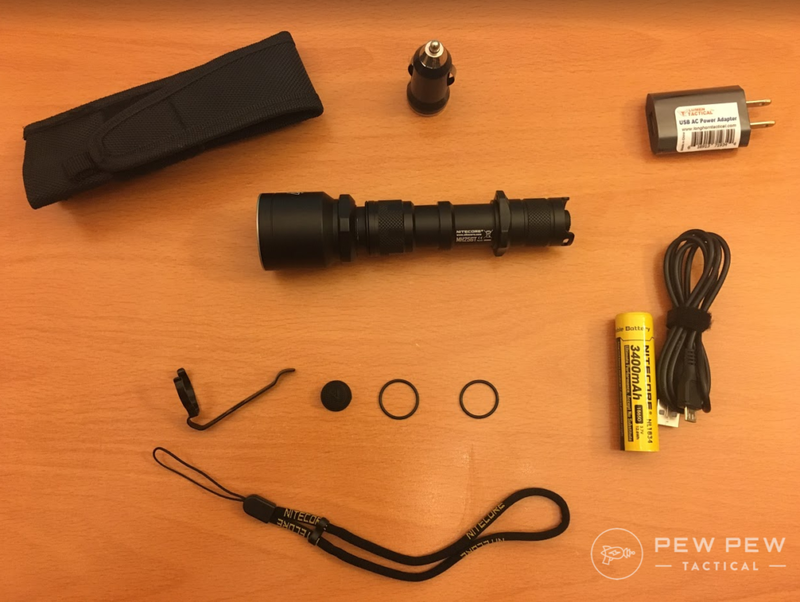 Our favorite pick for a small yet powerful tactical flashlight. You can tell from the images that the lights do suffer minor scratches and dings on the surface. But the lights all function just fine. 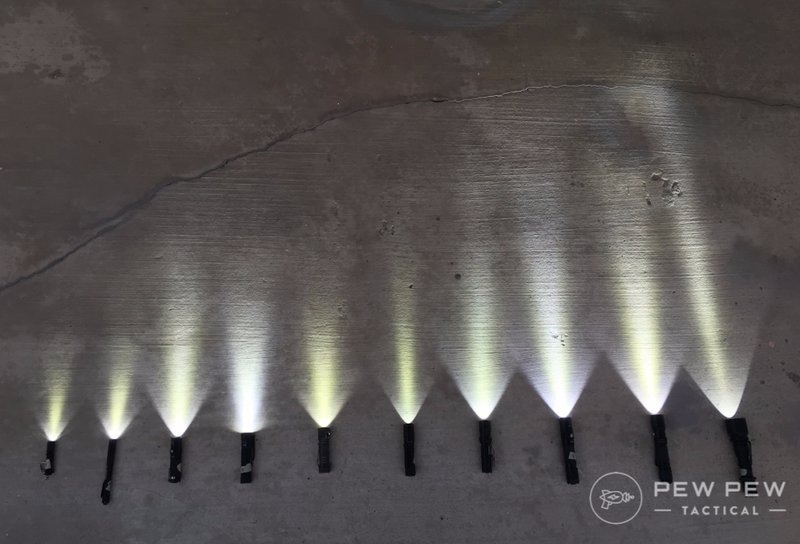 After 30 minutes, we took the lights out of the water and conducted a function test by cycling through all the light feature and output modes. Again all lights have successfully passed the test! 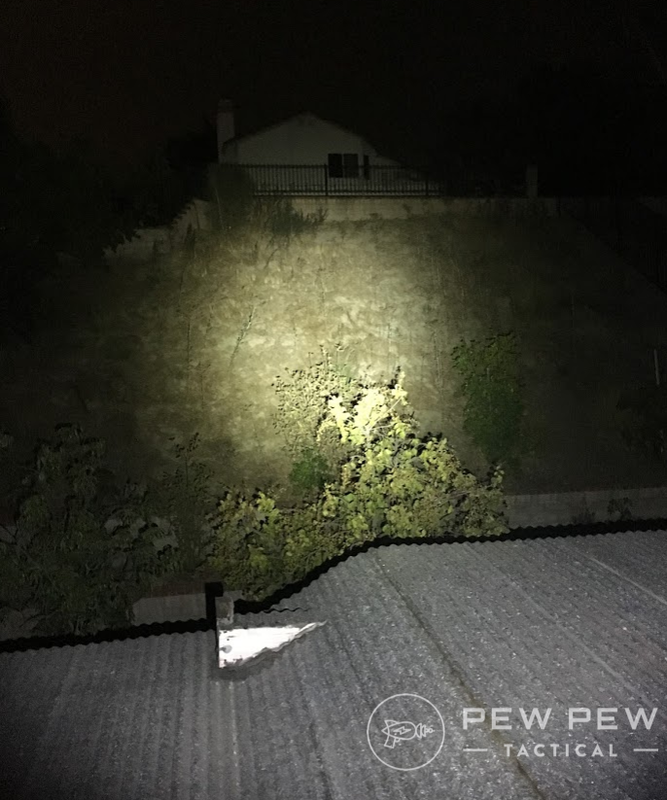 You’ll see more than the 5 lights in this test since we also have a Best EDC Flashlights article. Product engineering is always a trade off. And depending on what you’re looking for, here we have different solutions for you! If you want a light that shines through distance, the Nitecore MH25GT would be your best bet. 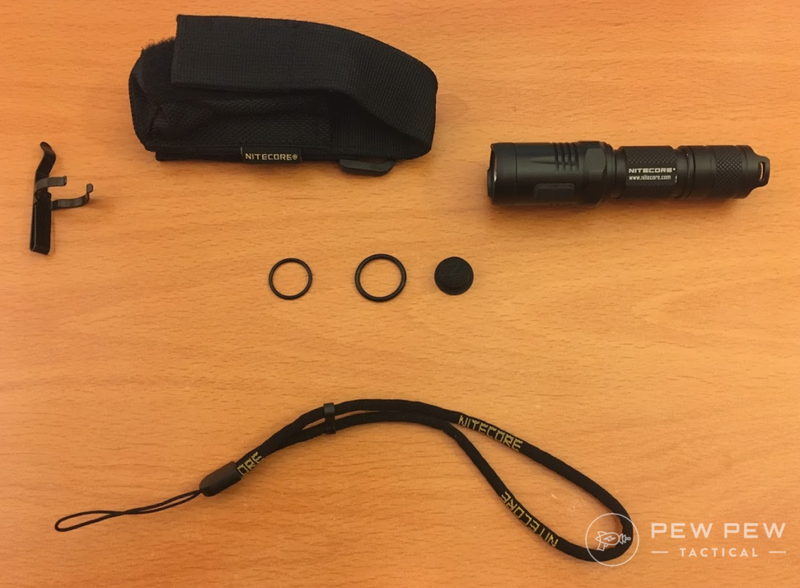 Both ThruNite TN12 and Fenix PD35 TAC are your standard tactical lights, while TN12 seems to be easier to use and more affordable. If you want a tac light that fits well in the pocket and has a nice red firefly light, go with the Nitecore MT10A. 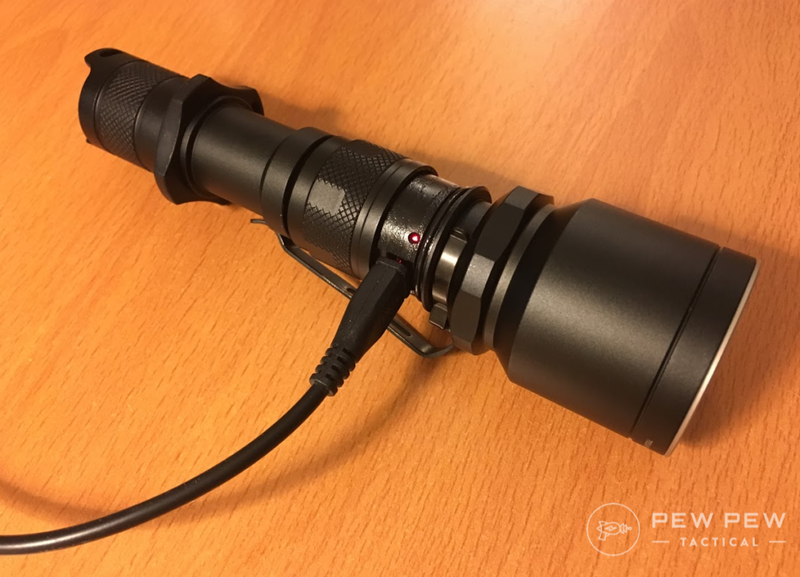 And the Streamlight ProTac 1L-1AA would be an ideal light for someone who prefers single button operation. How did we do? Any that we missed that meet our criteria of at least 500 lumens, tail button activated, and under $100? Or if you’re looking for something attached to your gun…Best Pistol Lights and Best AR-15 Flashlights. 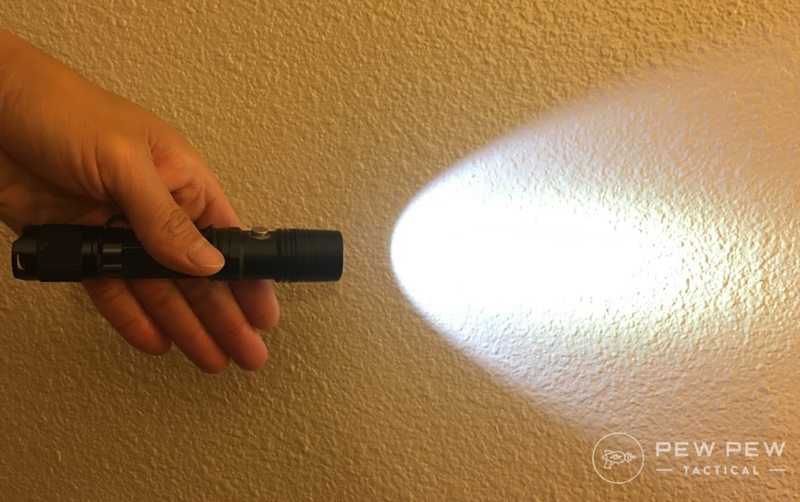 Have you ever checked out Olight? They have very reasonably priced flashlights with decent lumens. Is a > $100 light worth it? 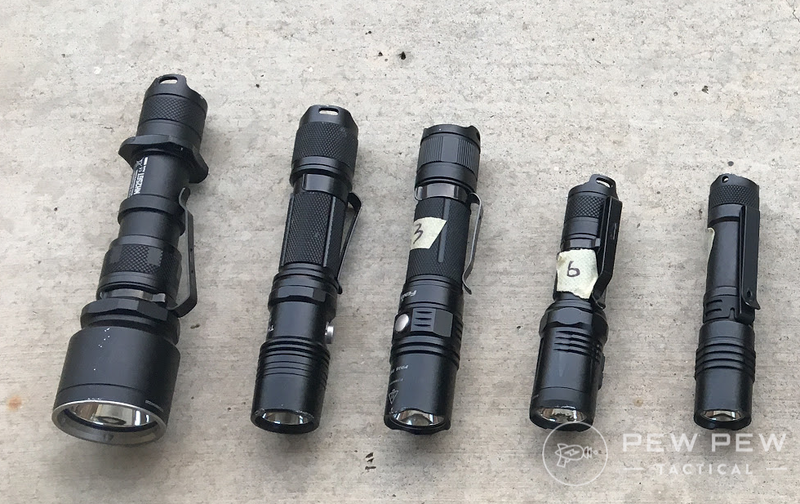 How do the Surefire and Elzetta lights compare? Have you looked at any Klarus flashlights? In particular the Klarus XT11GT? I would love to see your thoughts on that light. 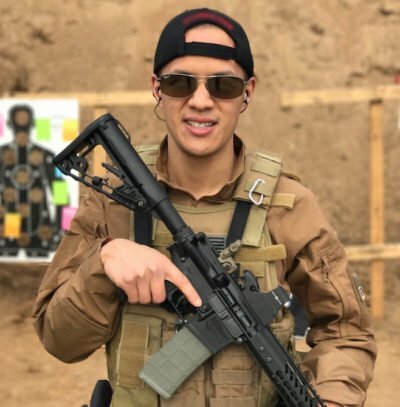 Hi John, haven’t tried out any handhelds, but one of our writers liked it as an AR-15 mounted light…article here. Agreed, I am stunned that the XT11Gt was not one of the top 5, let alone being number 1. I love my fenix tk-16. 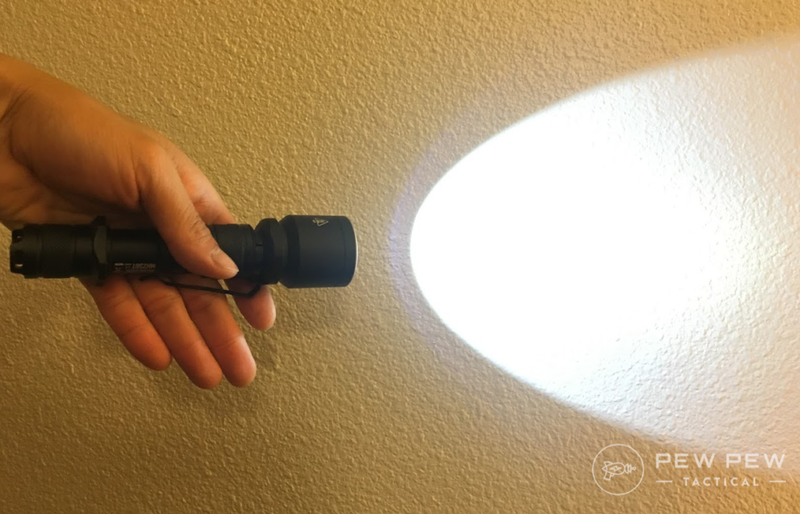 Great light for everyday and tactical uses. I have one for the car and one foe the house. 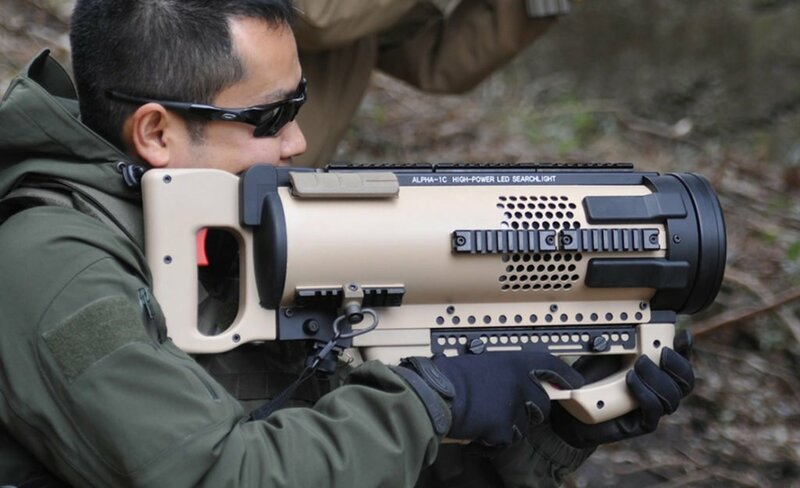 I love the tail switch only design and the fact I can get a remote switch for use with firearm platforms. Try Streamlight Protac 2L-X and HL-X. They have 500 lum and 1,000 lum respectively, both use 2xCR123A or 1×18650. From factor for the 2L-X is similar to 1L-1AA, just longer. HL-X has a bigger bezel.